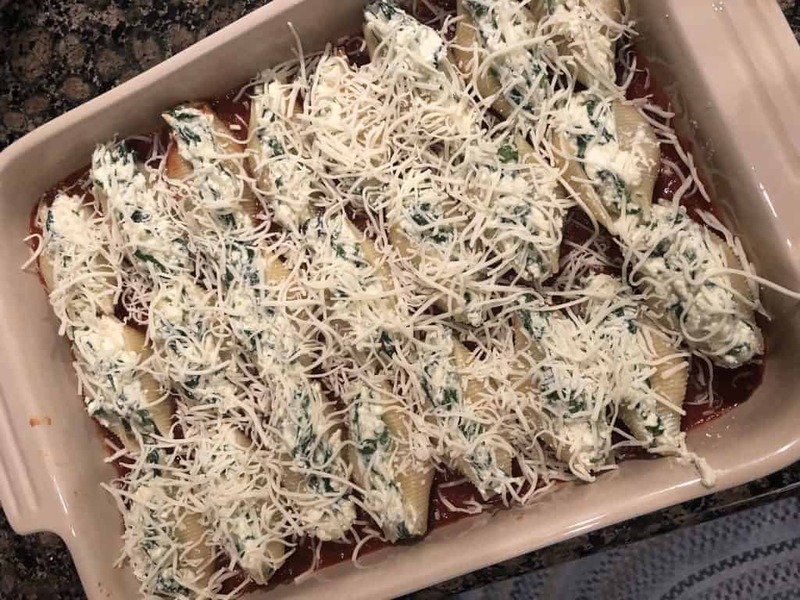 The much anticipated first blog post, Stuffed Shells!It only seemed appropriate that the first dish I ever cooked on my own, be my first recipe on my blog. 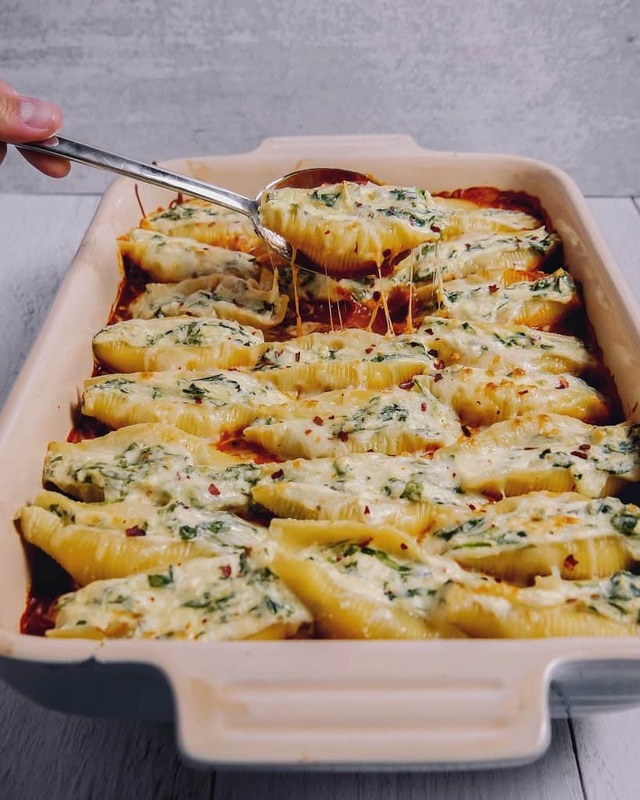 Growing up any time my mom would ask me what I wanted for my birthday dinner, it would always be these stuffed shells. 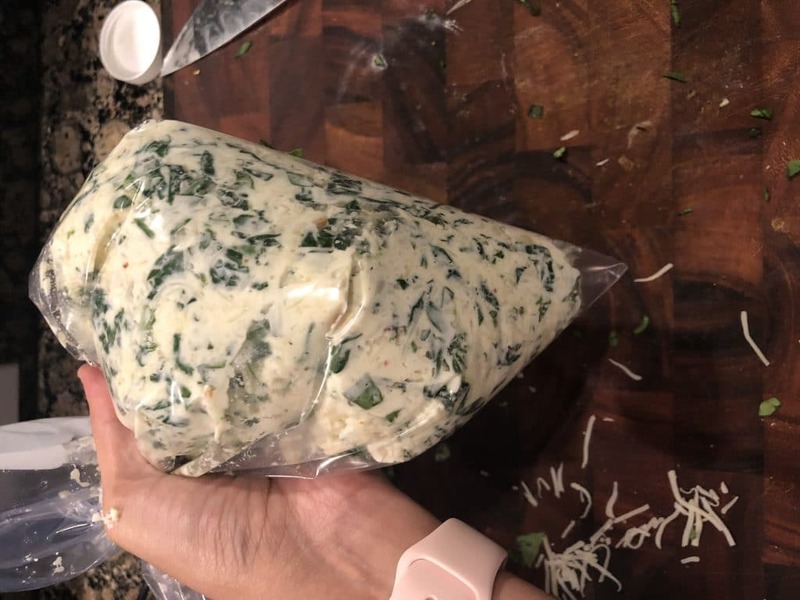 I mean spinach, cheese, garlic… count me in! 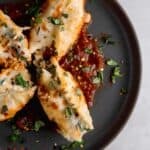 It wasn’t until maybe the 20th time that I made this recipe, that I found a better way to stuff the shells. I’ve always used a spoon, but I ended up having more on me than in the actual shells [facepalm]. I’m not much of a baker so I don’t have piping bags, instead I used a gallon sized ziplock bag. I emptied the stuffing inside, pushed it to one corner, and cut a hole to allow the stuffing to squeeze out. Ahhhhh much better. Another key is to make sure the pasta is al dente. I cooked my shells for about 8-9 minutes. If you over cook them, they will fall apart when you’re stuffing them. They will finish cooking in the oven. 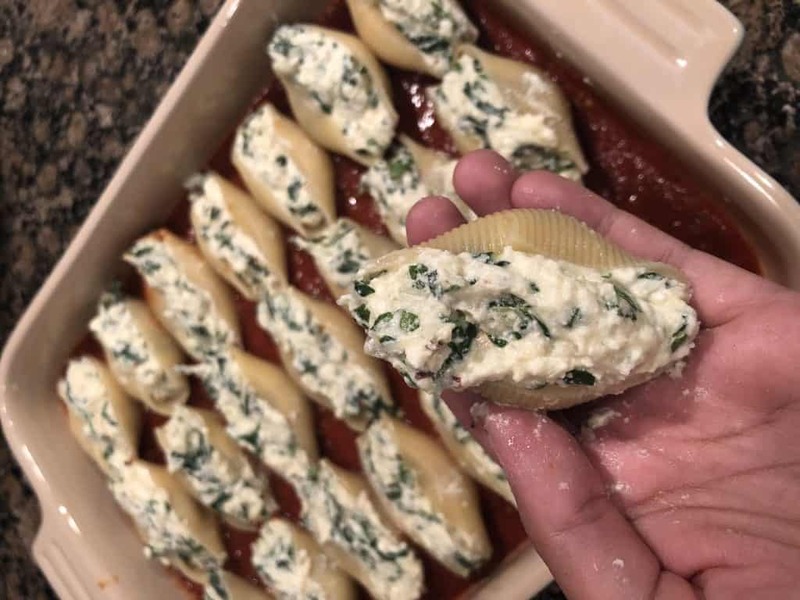 If you have filling leftover, but no more room to add shells you can add some more filling to the ones that you may have skimped on. Add some cheese on top (the theme here is cheese on cheese clearly), cover with foil and into the oven they go. Remove the foil and broil till the top of the cheese is brown and bubbly. This recipe is the most requested by my family/friends when I ask them what they want me to make and I know your family will love it too! See the video below for cooking and assembly! 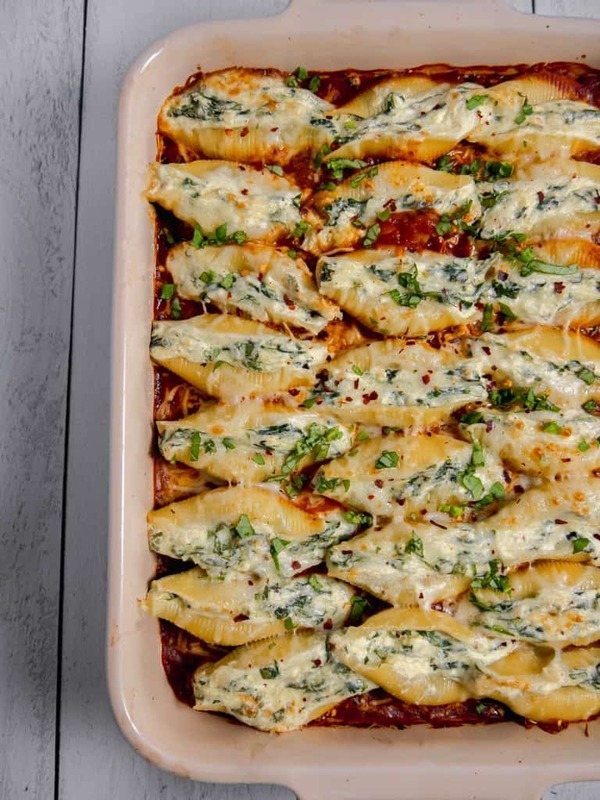 These spinach and cheese stuffed shells are a cheese lovers dream! In a skillet heat 1 Tbsp olive oil over medium high heat, add garlic and cook till fragrant about a minute. Add in chopped spinach, fresh ground pepper, salt, and sauté till spinach begins to wilt. About 2-3 min. 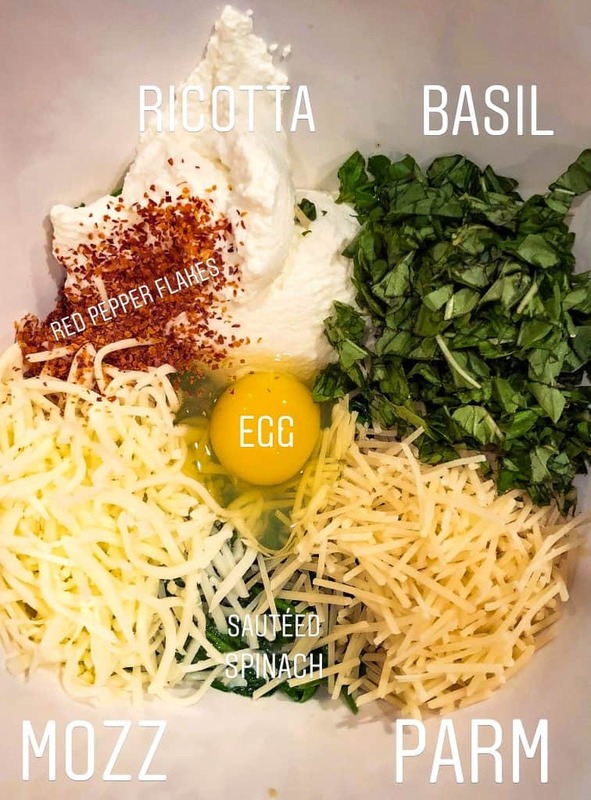 In a large bowl add spinach mixture, cheeses, egg, basil, red pepper flakes and mix together. Cover with foil and bake for 20 minutes. Remove foil and low broil until cheese begins to bubble and brown. Garnish with fresh basil and serve. When boiling the pasta shells, make sure you do not overcook or they will break when filling. Cook pasta to al dente and they will finish cooking once in the oven. 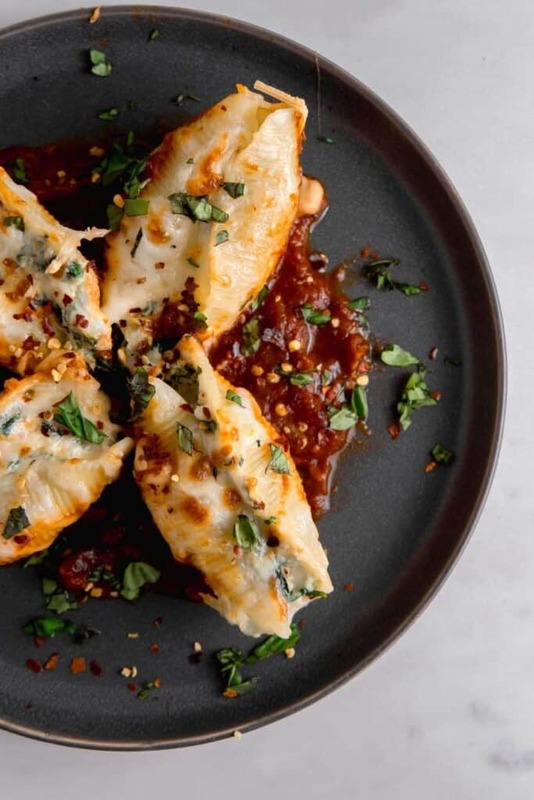 To fill the shells you can use a spoon, but it may get messy. I took a gallon sized ziplock bag and put all the filling inside and cut a hole to mimic a piping bag. This made filling the shells less messy. This dish is why I started to follow GWTIC’s recipes. Someone posted it and I just simply had to make it for myself and guys, OH-EM-GEE….So good!